Commissioner for Online Safety Act Anne Dunn with Attonery General Aiyaz Sayed-Khaiyum. If you have nothing nice to say, don’t say anything at all, says Commissioner for Online Safety Act Anne Dunn. Speaking to the Fiji Sun yesterday, Ms Dunn highlighted the role of the Online Safety Commission which came into effect on Tuesday, January 1. She said the legislation only permitted things that were electronically posted from January 1 and not before that. However, if the old posts are shared or reposted after January 1, then complains could be lodged if it causes harm. 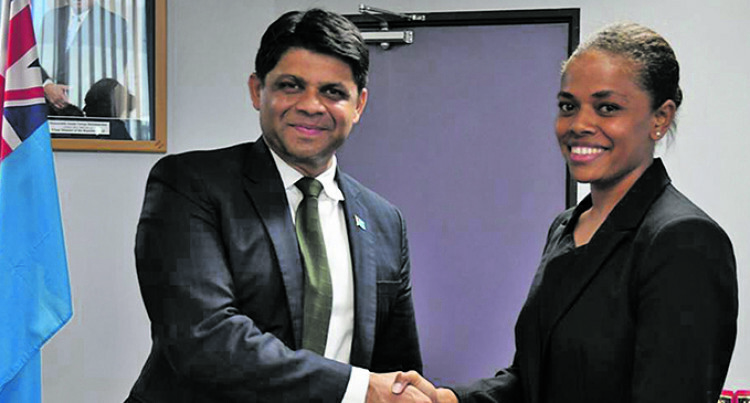 Ms Dunn said that under the legislation, the commission would only be allowed to have jurisdiction over the things that have been posted online in Fiji and not overseas. “You can complain about something that affected you whether it was immediate, you read it and you felt some type of way about it and it caused you serious harm,” she said. “The commission is there particularly for young women, man and children and those who have been affected by cyber bullying and cyber attacking. “Complaints taken to the commission will be assessed and advised accordingly. Ms Dunn also highlighted that there had been suicide cases in the country due to comments or words that were shared on cyber space. She said the idea of the commission was to provide a space to assist with that and to be able to advise on the steps one could take. But, ultimately the commission is hoping to navigate through cyber space in a safe manner. The commission is hoping to run educational awareness programmes and promoting various online safety materials. A person who posts an electronic communication with the intention to cause harm to an individual. A person who posts an electronic communication where posting the electronic communication would cause harm to an ordinary reasonable individual in the position of the individual. “It will also refer to people who send private messages online,” she said. According to the Act; A person who commits an offence is liable upon conviction to— (a) in the case of an individual, a fine not exceeding $20,000 or imprisonment for a term not exceeding five years or both; and (b) in the case of a body corporate, a fine not exceeding $100,000, and for a director, chief executive officer, manager or officer in charge for the time being, to a fine not exceeding $50,000 or to a term of imprisonment not exceeding seven years, or both. “The commission is here to help,” she said. The Online Safety Commission’s office is located on level 9 of the Suvavou House. It is currently under the assistance of the Solicitor General’s office and the Attorney-General’s chambers. According to Ms Dunn, two positions inclusive of a research officer and a complaints officer would be advertised soon. Meanwhile, the commission has started receiving complaints as of yesterday. Anne DunnFIJI NEWSOnline Safety Commission.